The Cushion-Lok™ Solid-Top Series is a tough PVC based workstation mat for dry applications where anti-fatigue and anti-slip properties are a necessity. 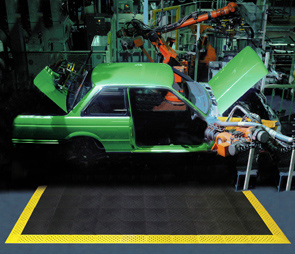 Mats are available with a yellow or black beveled ramp which eliminates trip hazards. Comes with a thick grit coating for additional traction in extremely slippery environments. Black tiles and ramps made with 100% recycled materials. The worker is elevated on a series of traction blades that provide sure-footing and comfort. Six-inch wide diamond-studded beveled ramps are permanently affixed and perforated for any incidental drainage. Maximum resistance to crushing featuring a reinforced bottom surface and firm support for the worker. Thick gritted layer applied to the top surface for extremely slippery environments.